Water transportation remains a critical part of the US economy. Approximately 2.3 billion tons of waterborne freight were transported via the inland, coastal, and Great Lake waterways in 2018, according to Amadee+Company’s 2018 US Waterborne Freight Transportation report. 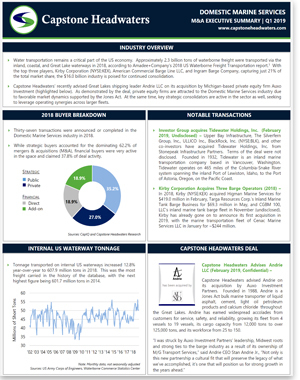 With the top three players, Kirby Corporation (NYSE:KEX), American Commercial Barge Line LLC, and Ingram Barge Company, capturing just 21% of the total market share, the $16.0 billion industry is poised for continued consolidation.